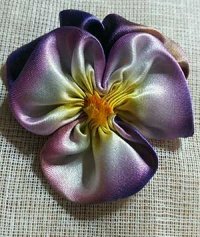 Cindy Oravecz uses Hanah Silk Ribbon for many of her dimensional flowers; Wild Iris is perfect for pansies. Made in the USA, Hanah Silk Ribbon, is hand-dyed and bias cut. It can be washed by hand or dry cleaned.